Performance no. 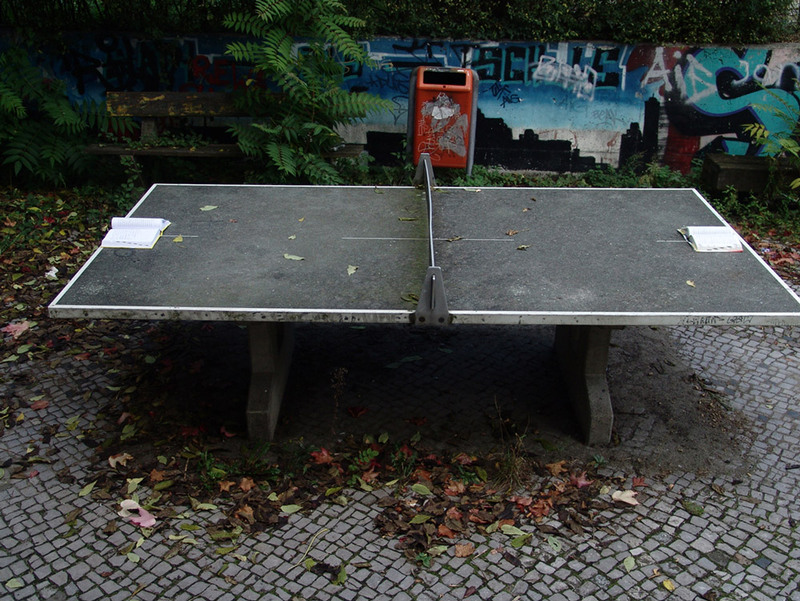 1 / Berlin at Reloading Images temporary school, Oct 2007. Performance no. 2 / Tehran at Parkingallery’s rooftop, March 2008. Performance no. 3 / Montpellier at Gallery AL/MA, June 2008. Contrary to a real dictionary claiming to give the exact meanings, the truth or the significance of the words and the things, this dictionary is based on improvisation from individual and collective memory. Every word reminds us of an emotion, a memory, an image, an opinion or a reaction that we exchange in our language. 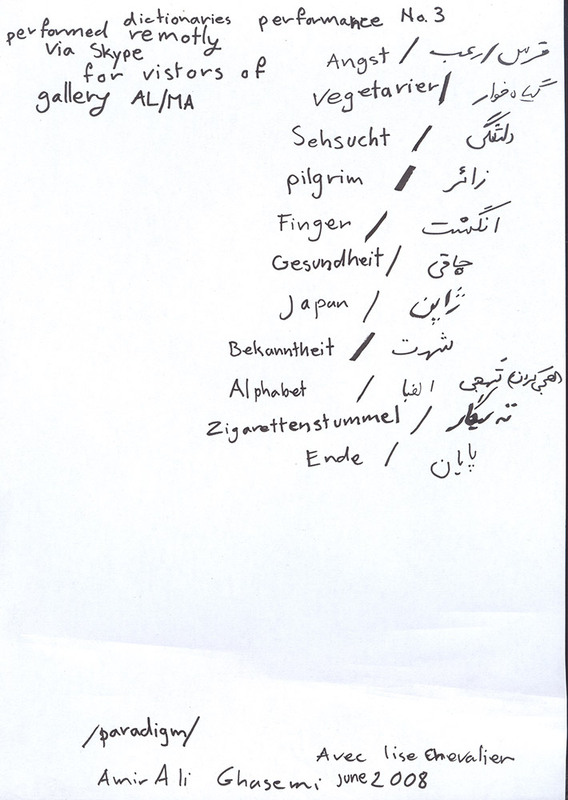 The words are chosen by chance, face to face, during a performance with real dictionaries, Farsi/French and then later Farsi/German. 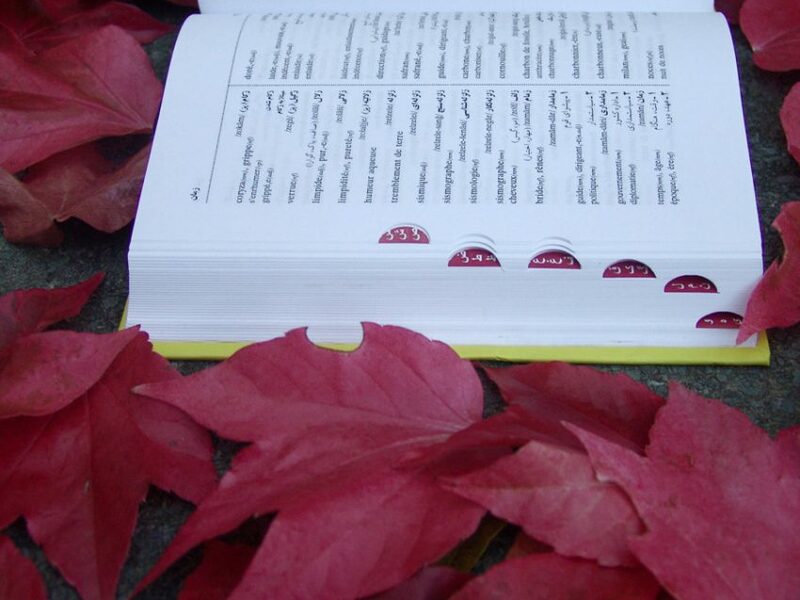 Every word will be defined 2 times: in both languages. Lise is speaking French/German and AmirAli speaks Farsi, this definition dialogue will be absurd and fails but we try to achieve/enhance another form of dialogue. 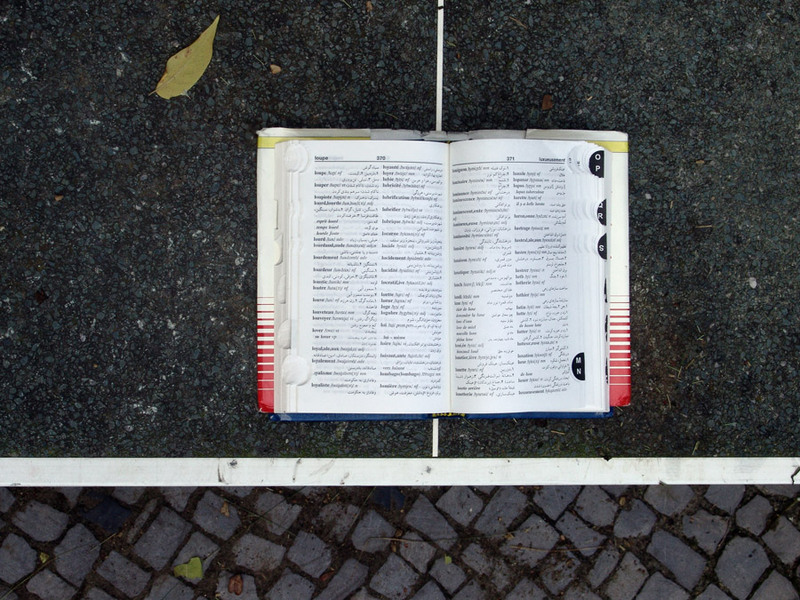 This dictionary is developed during our meetings, by the nature of the performance which has 2 performers, the first part took place around a ping pong table in the yard of an old school in Berlin in August 2008 and later as a presentation, the recorded sound of the spoken definitions where installed next to a window looking at the ping-pong table beside the French / Farsi dictionary books used in the performance. 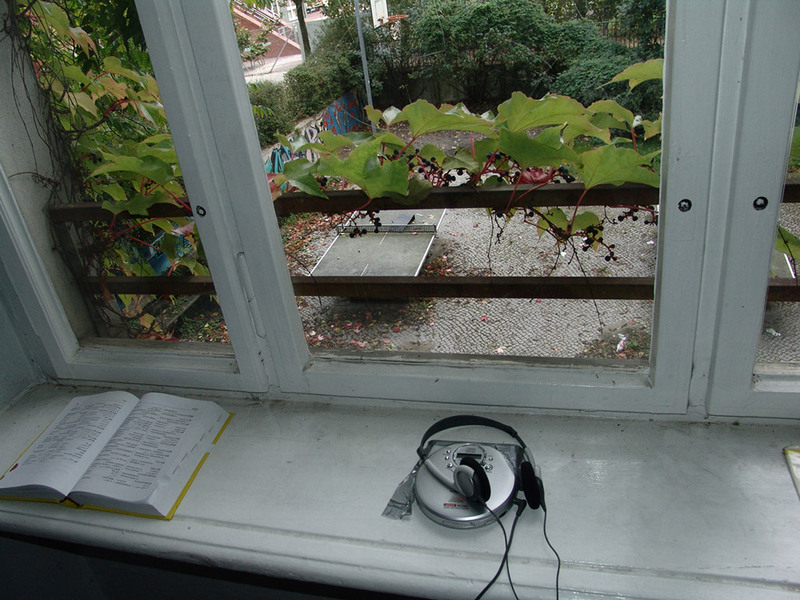 The second performance took part on a rooftop in Tehran in March 2008, for that one we decided to speak on the words we already found in Berlin. This experience showed us to see how the words interact differently with us, as it had 6 months passed in between. This new improvisation changed our definitions slightly. The 3rd meeting as a consequence of the fact that the performers are living far apart from each other, could be realized through an Internet call service (skype), having an appointment on precise time on the Internet, happened to be the opening of a group show titled “Paradigm” at ALMA gallery,in Montpelier. This was the 1st time when the dialogue actually went public life, in German and Farsi for a French-speaking audience. The sound was played over a “washing machine’ which is actually a word taken from the previous definitions came up in the Berlin. 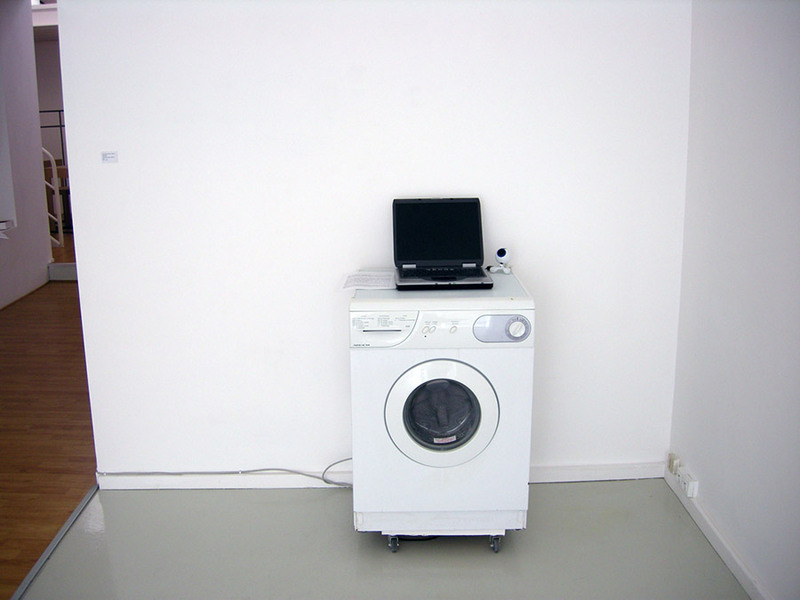 This washing machine acts as a metaphor from the project because she is there, as a «residu» from the performances which has lost its original function. The process of improvisation in the definition makes a re-appropriation from the words, to make a link with them again, to accept that they can provoke us and that they act on us, in our experience and not just our knowledge. No more a tool, words became the reason to talk. 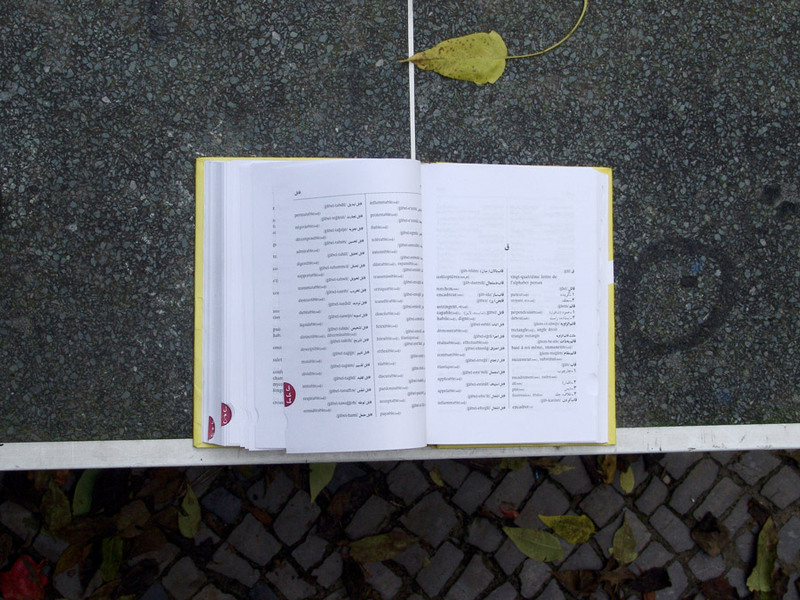 This dictionary doesn’t establish new definitions but more tries to be curious to learn the meaning of words, to redefine them for ourselves, to observe what they activate in our individual and collective memory. Speaking in different languages than what we understand, our definition and connections to the words are really different, we speak more freely without being afraid of being misunderstood, the re-transcription of performance is an interesting step to understand the dialogue, even if a proper translation of it seems to be impossible to some degree.